Alternative disputes resolution comprising arbitration, mediation & negotiation or mutual conciliation is gaining popularity in Bangladesh due to several awareness initiations from different corners. Business communities are now more or less aware of ADR nowadays. The dispute resolution clauses in the agreement covering all three mechanisms are generally found in most contracts, for example, construction, commercial, joint venture agreements etc. Besides that our civil procedure code makes it mandatory for the court to try ADR before proceeding for trial. Due to long delays in resolving disputes in court, ADR is gaining popularity within Bangladesh. Our firm is witnessing increasing numbers of local arbitration & Mediation for the last few years. A separate team of lawyers is assigned for effective disposal of the matters in this area. – Chambers & Partners, 2018. Mr. Rahman was present while BIAC signs deal with Permanent Court of Arbitration along with Hon’ble former chief justice, Hon’ble Ambassador, retired justice, senior advocates, especially Mr. Ajmalul Hossain QC, CEO and Chairman of BIAC. Rahman’s Chambers was involved with the very first Mediation of BIAC also works with BIAC for a long time on Arbitration, Mediation and other ADRs matters. We have significant experience in dealing with all form of ADRs mostly in the capacity as a counsel. The Chambers acted as counsel for builders, land owners, banks, NBFIs, the central bank, power sector companies, contractors, employers etc. either for negotiation, mutual consultation, mediation and arbitration, both ad-hoc and institutional. We have sound knowledge and experience of conducting ADR matters for Shipbuilding, construction, information technology, banking and other industries. Mr. Rahman was involved with all sorts of ADRs form the very beginning of his career in law since 2004. In 2018 Mr. Rahman is enlisted in the prestigious Panel of Arbitrators of SAARC Arbitration Council (SARCO). 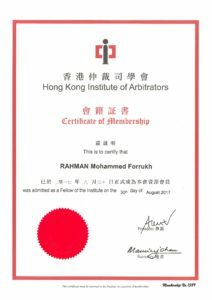 He is the very first Fellow of Hong Kong Institute of Arbitrators from Bangladesh. He is a CEDR accredited mediator and also a panel mediator of Bangladesh International Arbitration Centre (BIAC). 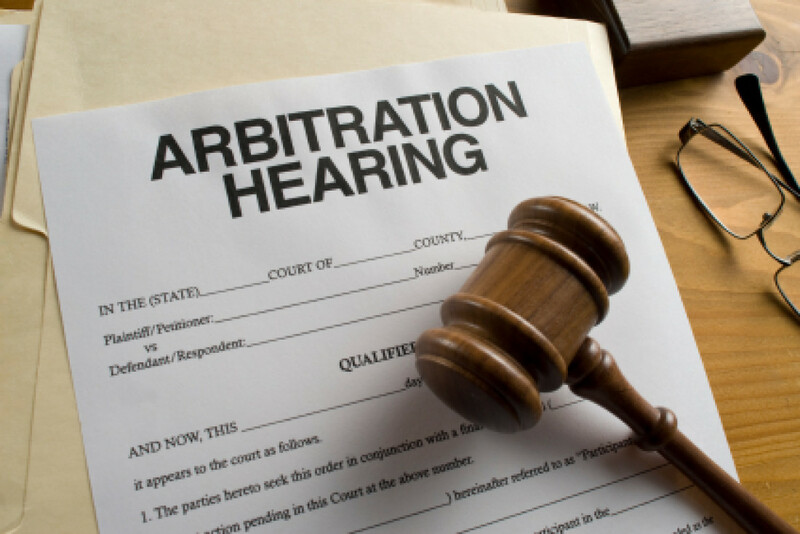 Since 2004, the Firm also has significant experience in handling litigation arising out of arbitration. In BPDB vs. Summit Industrial & Mercantile Corporation Ltd & Others reported in 19 BLC (2014) 284; 2 CLR (HCD) (2014) 73, the Chambers successfully challenged the appointment of the arbitrator on the ground of Bias. In 2018 we have successfully completed two arbitrations for Infrastructure Development Company Limited (IDCOL) in the area of Banking and were successfully able to persuade the tribunal to pass awards in our Client’s favor involving the recovery of outstanding dues against Bhelabazar Shamaz Unnayan Sangstha (BSUS) and Kamrul Bio-Gas & Compost Fertilizer Research Development Company Limited. Suits for enforcement of arbitral awards have been filed. We have completed arbitration for Quality Timber Ltd. in the area of construction & engineering. We represented the landowner before the tribunal and argued on legal implications of Joint Venture (JV) Agreements, Power of Attorney (POA), Mortgage and several contractual terms and conditions involving termination, contractual remedies etc. We have successfully resolved VAT claims by the National Board of Revenue (NBR) in favor of our Client Grameen Danone Foods Ltd before a facilitator appointed under ADR mechanism of VAT Act 1991. The Chambers was successfully able to settle the high demand imposed arbitrarily and reduce it considerably, with the help of the facilitator involving significant VAT imposed on alleged misuse of raw materials. We have successfully represented Bangladesh Power Development Board (BPDB) in a number of proceedings arising out of local arbitration pending both in District Court and High Court Division against Summit Power Limited and Quantum Power Limited both involving interim injunction on payment on deduction of liquidated damages under power purchase agreement of several IPP Project. Upon receiving an appointment as mediator by BIAC we have successfully commenced mediation proceedings between a Bank and Borrows on more than one occasions. The Firm was involved in the very first mediation conducted by BIAC involving a dispute between shareholders. We have successfully represented the Central Bank in a high profile negotiation and mutual consultation involving a million dollar dispute involving the implementation of a national payment switch throughout the country by a Singaporean IT Company. Please find a separate practice area for International Arbitration. Arbitration is binding when it comes from a contract, where the parties agreed to resolve all the disputes through arbitration arising out of that contract. The arbitral award of an arbitration proceeding shall be final and binding upon the parties and on only some limited grounds the arbitral award can be challenged. We provide complete service as local counsel and draft statements of claim or defense, including several applications, represent clients before the tribunals. We have also conducted a number of examination-in-chief, cross-examination and placed written and oral arguments before the Tribunals. Besides that, the Chambers also assist clients in filing the relevant application before the relevant court of law for appointing arbitrators, injunction etc. The chambers have substantial experience in assisting clients in both institutional arbitration i.e. BIAC and also ad-hoc arbitration. Mediation is a speedy, cost-effective and private form of alternative dispute resolution. It is a way of resolving disputes between the parties with the assistance of a neutral third party mediator. The role of the mediator is only to assist the parties in reaching their own decision to resolve a dispute. Meditation is also a binding process when it comes from a contract. Mr. Rahman is an accredited mediator and has extensive experience in mediation. He has been appointed as Mediator by BIAC in several mediation cases. Under the leadership of Mr. Rahman, the Chambers has successfully mediated a number of mediation cases. 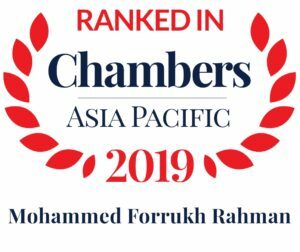 The Chambers has an experienced ADR team mainly composed of trained lawyers, working under the guidance of Mr. Rahman. The Chambers has extensive experience in negotiation, mutual consultation and other statutory ADRs. We were involved in several negotiations and mutual consultation process on several matters for e.g. out of Court settlement of a number of Admiralty suits, negotiation over land transactions, participating in negotiating meeting for the Client etc. Article: A look into Alternative Dispute Resolutions (Vol. 1 of 2014). Article: Power Sector related Arbitration in Bangladesh (Vol. 1 of 2016). Mr. Rumee Ali, CEO of BIAC speaks as Guest on Honour at our Annual Dinner on ADR.